Hearts and Love and Jazz ! 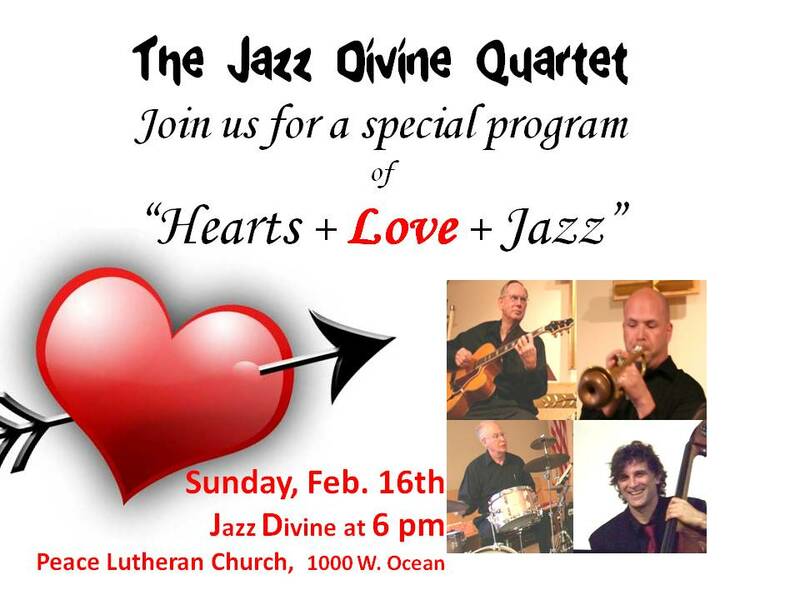 The Jazz Divine Quartet will present a special program of songs of love on Sunday evening, 6 to 7 pm, February 16th, at Peace Lutheran Church, 1000 W. Ocean Ave. in Lompoc. The program is open to the public and light refreshments will be served. Jazz standards for the evening will include, "My Funny Valentine," "My Ship," "My One and Only Love," "All the Things You Are," and "As Long as I Live." There is no admission charge but a freewill offering will be collected to help cover costs of the program. The Jazz Divine Quartet consists of Santa Barbara bassist Jason Bray, Santa Maria jazz guitarist Ed Hite, Paul Barthel on trumpet and flugelhorn, and Geoff Moran, drums, both from Lompoc. For more information contact Geoff Moran at 805-735-3760.